Russia sent its so-called 77th ‘humanitarian convoy’ to the occupied Donbas. This was reported by the press service of Russian Emergency Service. “The humanitarian column of the Russian Emergency Service has reached the Donetsk”and “Matveev Kurgan” checkpoints on the Russian-Ukrainian border. All cars of the column”have passed the necessary customs procedures” in accordance with the international legislation on the delivery of humanitarian goods,” the department assures. According to the agency, the ‘humanitarian convoy’ contains more than 400 tons of humanitarian cargo, which supposedly consists of children's food kits and equipment for emergency and rescue operations. 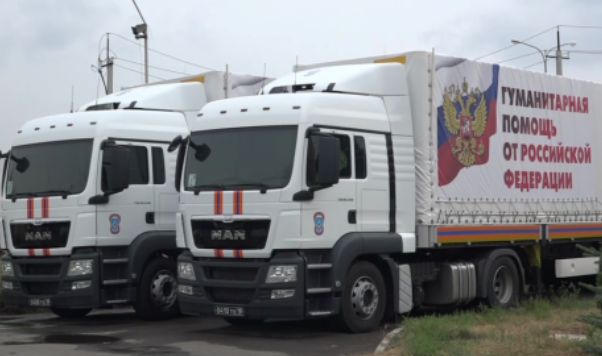 The entire cargo will be fully unloaded at the checkpoints of Donetsk and Luhansk regions and will be further distributed among the regions of the occupied territory. As it was reported earlier, Russia sent its 76th so-called ‘humanitarian convoy’ to the occupied by the militants Donbas on May 8. Russian authorities have been sending the so-called humanitarian convoys to Ukraine since August 2014. The Russian side claims the trucks carry food, water, medicines, books, agrarian instruments and other necessities. Ukrainian border guards cannot check the contents of trucks, and Russia refused to send their humanitarian aid through the controlled checkpoints on the border, as requested by Ukraine. Ukraine insists there are weapons and ammunition aboard the trucks, so they reach Kremlin-backed militants that keep on attacking Ukrainian positions.